The day began with grey skies after a light overnight rain–our first precipitation in over a month. 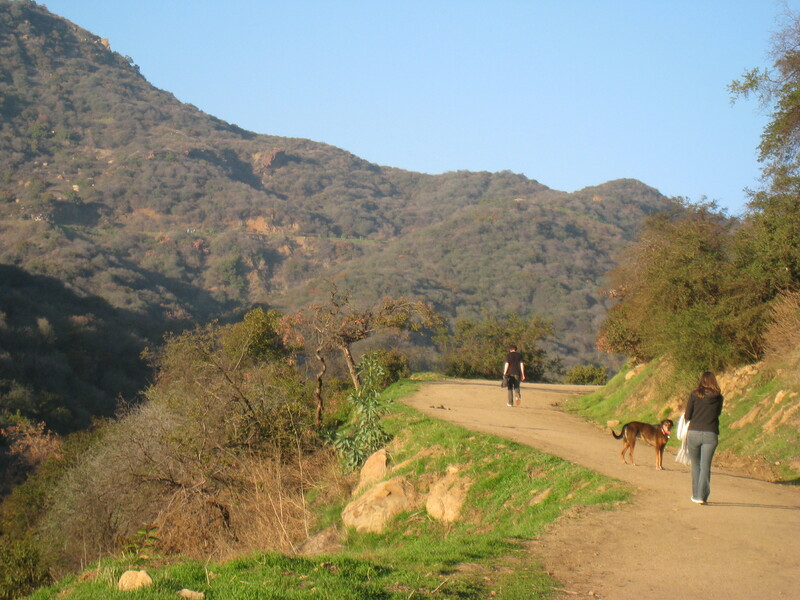 By afternoon, it was crisp and sunny, so I took my dog to Bronson Canyon for a hike. The trail where police conducted an an exhaustive search for body parts Wednesday and Thursday was scattered only with fallen leaves. The only thing out of the ordinary was the ruts left behind by their vehicles . One is never entirely alone on the trail, and today I had the company of at least two dozen other hikers and their dogs. Everyone seemed assiduous in their avoidance of the obvious topic of conversation. Still, talk of the murder broke through a few times in overheard conversations. Andrew Hill, who lives on the second floor of the apartment building, told The Times he heard a lot of commotion on the floor above him at about 3 a.m. about three weeks ago. He said he heard furniture moving as well as screaming and yelling. He said he spoke to police detectives Thursday and they asked him when the garbage was taken out. 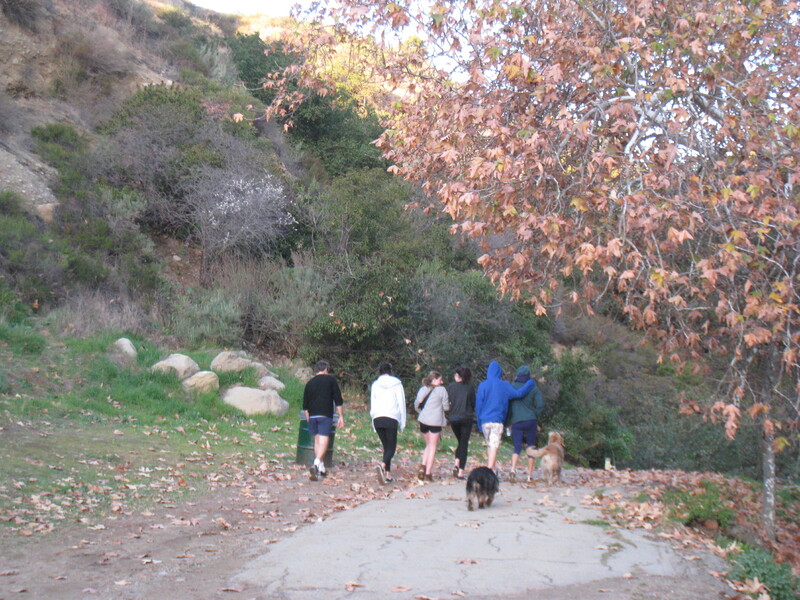 Medellin’s friend Vilma Aguilar told KCBS-TV Channel 2 that Medellin hiked through Griffith Park. During one hike last year, she said, he met a new friend. The search included the area of dense brush at left. The man whose head, hands and feet were found in Bronson Canyon this week was Hervey Medellin, a 66-year-old retiree who lived at 6238 DeLongpre Avenue in Hollywood. According to neighbors, Medellin had gone to Tijuana before New Year’s and not returned. His car was impounded from the garage of the apartment building as the police investigation continued. Medellin worked for Mexicana Airlines before his retirement and apparently had no family in the area. 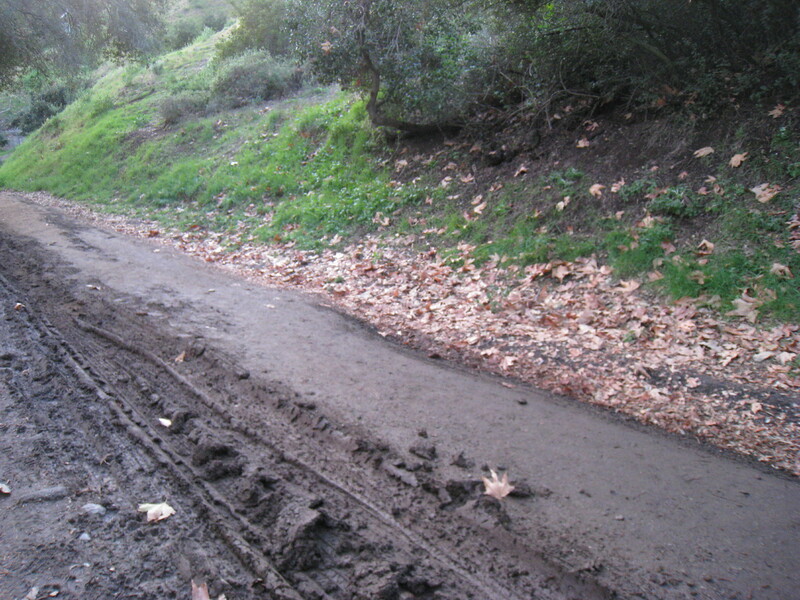 Bronson Canyon Park reopened to the public today. The park was combed by more than 120 law enforcement officers during the two-day search. According to CNN.com, the owner of the head, hands and feet found earlier this week in Bronson Canyon has been identified. The police have not released his name. “It’s standard procedure for us to have our detectives canvass the neighborhood,” Los Angeles Police Cmdr. Andrew Smith said. The bodyguard saw nothing unusual, he added. 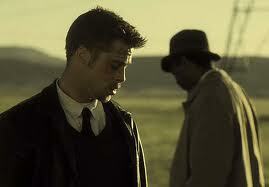 In an unusual coincidence, Pitt starred in the film “Seven,” in which he plays a detective and a severed head is found in a box. Apparently I’m not the only one who thought of “Se7en.” I didn’t mention the proximity of Brad Pitt’s house to the murder scene because I wanted to protect what little privacy he has left. So much for that antiquated idea! It brought back memories of David Fincher’s “Se7en,” which ends with the delivery of a box containing a woman’s severed head–Gwyneth Paltrow’s–to her husband, a police detective played by Brad Pitt. Although we (mercifully) never see the head, the moment is so horrifying that it’s as though we did. Back at Bronson Canyon, the investigation is coming to a close. The park is due to reopen sometime tomorrow. Investigators and search dogs combed Bronson Canyon today, finding a pair of hands and a pair of feet near the site of yesterday’s discovery of a severed head. According to a friend who tried to walk his dogs there this morning, Bronson Canyon Park–which includes the former quarry (aka “Bat Cave”) and trails leading to the Hollywood Sign–was closed to the public. It would be sad if Bronson Canyon became known for this macabre event. A a regular visitor, I intend to return for a hike as soon as I can. I hope others will do the same. 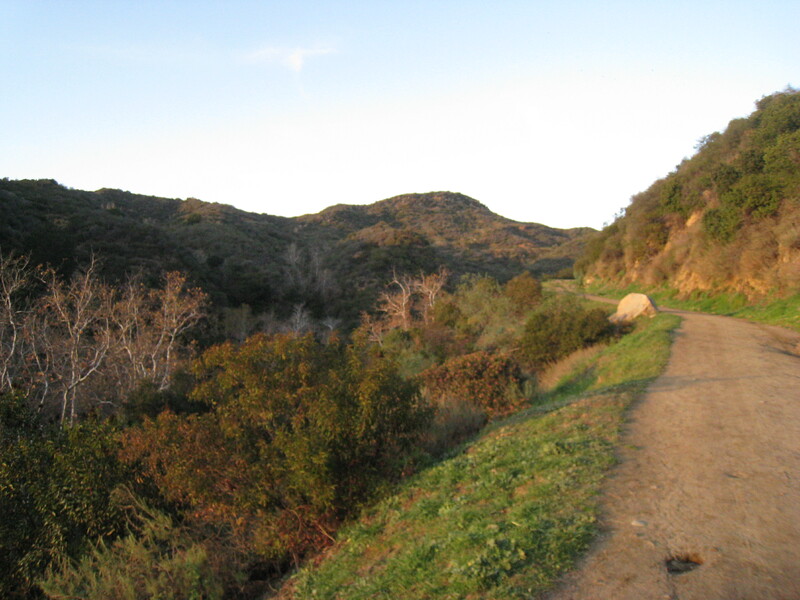 Those who hike in Bronson Canyon can attest to the ease with which they can leave the city and hit the trails. The last time I was there, on Christmas Day, my visiting sister was amazed at how quickly we reached wilderness from my house: 10 minutes by car and another 5 on foot. She remarked that it would take her more than half an hour to drive to a comparable area from her much less densely populated city on the San Francisco Peninsula. Since moving to Beachwood Canyon, I’ve experienced two other incidents of prolonged helicopter surveillance. The first occurred around 2007, when two hikers got stuck on one of the steep trails near the quarry. One was injured, and both required rescue. The second incident, in 2010, was the tragic death of Sally Menke, best known as Quentin Tarantino’s film editor, who collapsed in Bronson Canyon while hiking in record-breaking heat. According to the latest report, today’s emergency began when a dog discovered a human head in a bag. Leaving aside uncanny similarities to the work of Tarantino (and David Lynch), I have to wonder at this sentence from a press release I just received: The detectives are treating the case as a possible homicide. Possible? Update, 12:40am: The search was suspended at 8pm and will resume at sunrise on Wed., January 18th. Better hike elsewhere today. The fires started in the early morning hours of December 29th. The first broke out in the parking structure of an apartment building on N. Fuller, burning four cars and damaging an apartment above it. Then came three trash fires nearby, on N. Poinsettia, Sunset and McCadden. The arrests soon afterward–of a 22-year-old man, Samuel Arrington, in connection with the first two fires, and a 55-year-old man, Alejandro Pineda, in connection with the last–gave us reason to believe these baffling and unanticipated arsons had ended. By New Year’s Eve, Hollywood and West Hollywood were on high alert. I was surrounded by patrol cars as I drove north on La Cienega at 10pm, and found Hollywood Boulevard lined with more police cars than cabs. On Argyle, there seemed to be as many uniformed officers as revelers. Nevertheless, that night the fires spread to the Valley, with others in West Hollywood. On New Year’s Day, there was only one reported fire. It took place in the Valley and apparently wasn’t related to the others. 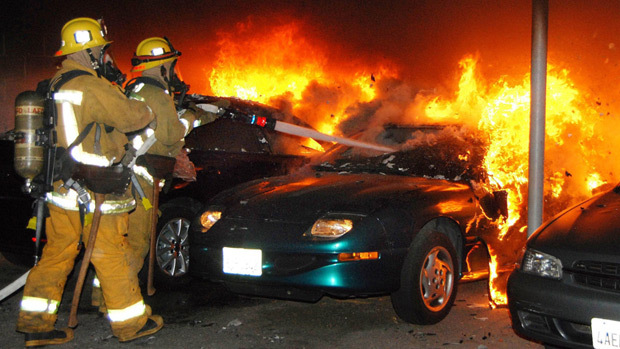 The arsons resumed on January 2nd with 11 fires, 9 in the Valley and two in West Hollywood. There probably would have been more if not for the arrest of the suspect, 24-year-old Harry Burkhart, by a quick-thinking reserve sheriff’s deputy at Sunset and Fairfax at 3am. Burkhart, a German national who was captured on video leaving the scene of a fire in the parking garage of Hollywood and Highland, was found with fire-starting materials in his van. He has been charged with 37 counts of arson. Meanwhile, Harry Burkhart has earned the nickname “Hollywood Feuerteufel”–“Hollywood Fire Devil–in the German press. He is on suicide watch, and his bond was set at $2.85 million. As for Hollywood, things are quieter now than they were during the arsons, when sirens and helicopters were heard all night long. But when a fire truck roared up Beachwood Canyon earlier this evening, sirens blaring, I felt an all-too-familiar dread. You are currently viewing the archives for January, 2012 at Under the Hollywood Sign.